Clearaudio Innovation Wood/Universal/DaVinci V2 review | What Hi-Fi? If building a great turntable is all about top-quality design and mechanical excellence, which we think it is, Clearaudio's Innovation Wood is off to a winning start. This is an astonishingly well-built turntable that combines rugged build with exceptional quality of fit and finish. And we do mean exceptional. Even by the standards of stratospherically priced kit this package is something special. The way the table's separate metal spindle-piece fits so perfectly into the hole in the centre of the elegant acrylic platter, sinking into place as if damped, deftly illustrates the precision with which this equipment has been machined. As befits a product called Innovation, there are plenty of clever ideas incorporated into the design. The fresh thinking starts with a ceramic magnetic main bearing that minimises friction and noise, and extends all the way to a high-quality DC motor and an electronic speed governor that switches from 331/3 to 45 and 78rpm at the push of a backlit button. As is typical for Clearaudio's designs, the £6265 Innovation Wood has no suspension, so careful positioning is a must to get maximum performance. Our general recommendation for turntable placement has always been to place it on a rigid, low-resonance support as far away from the speakers as possible. And that holds as true as ever in this case. That said, this deck has an extremely well damped structure, no doubt helped by the combination of aluminium and Panzerholz wood used in its chassis. Panzerholz is used in the armour plating of tanks which, glamorous though it might sound, isn't something that carries much value in hi-fi. However, it also turns out to be very good at damping vibrations, and that's far more useful in a turntable. If anything, Clearaudio's new pivoted tone arm, the Universal, feels even better put together than the Innovation. The company makes a range of parallel-tracking arms but, as suggested by the Universal's name, this one's meant for use with a wider range of decks and cartridges. Normally, arms feel fragile, but not this one. It's solid and brilliantly engineered, with a stepped carbon fibre arm tube, magnetic bias and an easy-to-adjust tracking weight mechanism. a record. The improvement in sonic performance is worth every penny of the £390 it adds to the standard Universal's £3110 price. a 30-micron-thick ceramic layer, which aids both rigidity and resonance control. The cartridge likes to track at a rather high 2.8g, but it does so with security. Its output level is decent, so gain won't be an issue with most partnering phono stages. 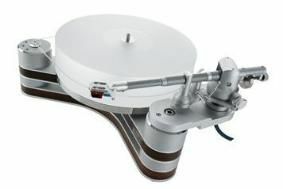 Combine the Innovation Wood, Universal and DaVinci V2 and you have a world-class turntable package. There's a real feeling that the three components are digging up every tiny bit of information from the record groove. All this content is skilfully organised and delivered with breathtaking composure. There's never a sense that the deck is having to work hard, even when something demanding like Orff's Carmina Burana really kicks off with its massive dynamic swings and massed instrumentation. There's no doubting the control and composure on show here, but this is also a record player that knows how to have fun. The combination of high-quality DC motor and strictly regimented speed control results in sure-footed timing. This aspect isn't emphasised as it is in some designs, but it's good enough for Bob Marley's Catch a Fire set to work a treat. Vocals are nuanced and natural, and overall transparency is absolutely top class. All in all, this record-playing package sounds as good as you'd hope at this price level. And we hoped for a lot. It's built superbly and is a joy to use, plus there's a feeling of precision engineering that few rivals we've used can match. Thirteen thousand pounds is an awful lot of money to spend on a record player. But, if you really want to hear what's tucked away in those record grooves, this Clearaudio package brings it all out as well as anything we've heard.